For its inaugural presentation at Expo Chicago, Alexander Gray Associates presents an exhibition of the conceptually paralleled artistic processes of Gallery artists from diverse geographical and cultural contexts, featuring recent and historical works by Luis Camnitzer, Melvin Edwards, Harmony Hammond, Lorraine O’Grady, Hassan Sharif and Jack Tworkov. The works on view span across a variety of media, including painting, photography, sculpture, and drawings. Central to the presentation is Melvin Edwards’ Good Friends in Chicago (1972), a double tiered steel sculpture, consisting of a mobile rocker atop a stabilized rocker form. Expo Chicago serves as a homecoming for the sculpture, which will be exhibited for the first time in Chicago since 1972, when Edwards made the sculpture in the studio of Richard Hunt for an exhibition of his work along with William T. Williams and Sam Gilliam at the Wabash Transit Gallery, an extension of the Art Institute of Chicago. Also included in the presentation are diptychs from Lorraine O’Grady’s series, Miscegenated Family Album (1980/1994), as well as photographs of the artist’s first public performance Mlle Bourgeoise Noire (1980–83). Throughout her career, O’Grady has blended ideas of personal and political identity, and combines strategies related to humanist studies on gender, the politics of diaspora and feminism, and reflections on aesthetics by using a variety of mediums that include performance, photo installation, moving media, and photomontage. German-born Uruguyan artist Luis Camnitzer employs language as a medium to comment on art making processes, form, and context. 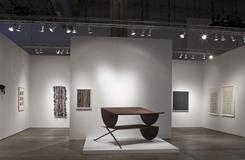 Early etchings and object boxes from the 1960s and 1970s, including Garden Wall Door Table (1968), examine the conceptual meaning behind printmaking and the connection between language, image and perception. American artist Harmony Hammond was a leading figure in the development of the feminist art movement in New York in the early 1970s. Combining gender politics with post-minimal concerns of materials and process, her work frequently occupies a space between painting and sculpture, body and object. In her recent monotypes on view, gridded fields of grommeted holes physically open the paper surface alluding to layers, spaces and histories buried below, as well as body orifices. Emirati artist Hassan Sharif, a seminal figure in conceptual art and experimental practice in the Middle East, explores craftsmanship and cultural context through his “Objects” series (1982–present), in which he assembles inexpensive and mass-produced goods from local markets. In Rug, Cotton Rope and Glue (2013), Sharif cuts rugs and rope, weaving them together in a rhythmically repetitive act that echoes the involuntary functions of the human body, such as swallowing, breathing, and blinking. A pivotal figure in the development of Abstract Expressionism, Jack Tworkov radically shifted his painting style in the late 1960s, as he moved away from overtly gestural brushstrokes to controlled diagrammatic abstraction, as seen on SS-68 #2 (1968). Taking an interest in elementary geometry, he turned to the rectangle and its potential measurements as the basis of pictorial composition. Drawings from this period convey spatial play of interlocking, folding, overlapping, or intersecting planes, with individual marks built up into slightly uneven densities to create a unified, field-like surface. Expo Chicago, the International Exposition of Contemporary & Modern Art, opens the fall art season each September at historic Navy Pier. Entering its fifth edition in 2016, Expo Chicago presents artwork from 140 leading galleries from around the world, and includes Exposure—a section that affords younger galleries the opportunity to participate in a major international art fair. Exposure provides critical opportunities for curators, collectors, and art patrons to survey the best in innovative and emerging programs.